When we think of clean tech we often envision natural elements like water powering a generator, or sunlight charging solar cells. However, another natural element, gold, is also driving changes that allow industries to thrive with less of an impact on the environment. Here, we look at three examples where gold is playing a pivotal role in creating a greener future according to the World Gold Council. Gold is also helping bolster the adoption of electricity-producing fuel cells. This innovation limits toxins in the environment because the only byproduct is water. Like the manufacturing of PVC, a catalyst is needed. However, in this case a special catalyst is required, one that can function at low temperatures. Gold is the solution. We’re likely to see a significant ramping up in the manufacturing of these cells as more industries and countries take ownership of the future of the planet. 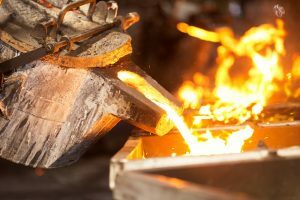 The result could be a further increase in demand for gold. In short: gold offers improved efficiency in solar panels. For solar cells to effectively harness the sun’s power they require gold nanoparticles. Why? Traditional designs require a web of wiring which sits on top of the solar cell. These wires, however, can block up to 10% of the sun’s light. Researchers have discovered a way to redesign the panels without the wires. Instead, scientist can place a thin film of gold on a silicone sheet. This film allows more light to penetrate and some estimate near-term designs to offer up to a 20% boost in efficiency. Therefore, solar-powered technologies will likely expand their reliance on gold. Moreover, in newer designs gold is also needed for the electrodes. These three emerging technologies illustrate the versatility of gold. While the element hasn’t changed we are constantly changing the way we can use it and finding new opportunities to expand its value in various industries. Can bitcoin do any of that?